FEMA authorized $70 million to Puerto Rico's water authority as questions arise over the safety of the potable water that has been restored, the agency announced Wednesday morning. Although the president of the Authority of Aqueducts and Sewers (AAA as it's known in Spanish) defended the quality of the drinking water, the EPA is recommending that Puerto Ricans take steps to ensure the water is safe for drinking. “Right now, we recommend that all water be used for drinking, brushing teeth, cooking, or washing dishes be boiled,” Puerto Rico’s EPA director Carmen Guerrero, was quoted saying by the island’s newspaper El Nuevo Dia. Guerrero said that though the water supplied by AAA complies with the standards of the Health Department, there have been ruptures along the pipes that can cause contamination and noted the call is for prevention. 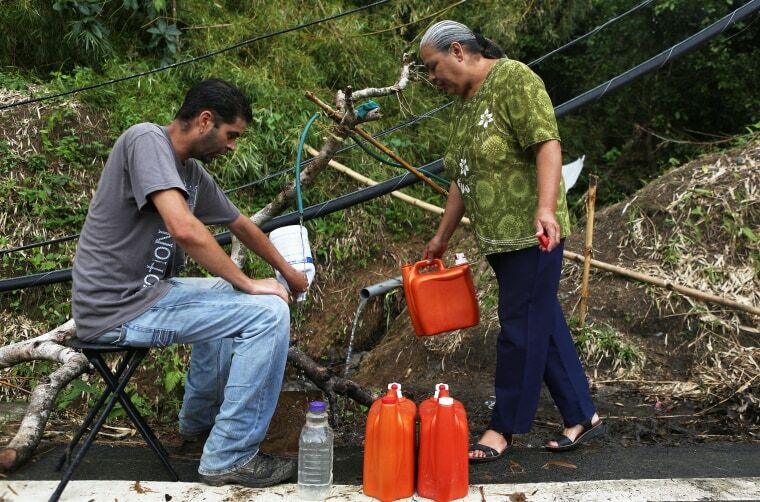 Around 63 percent of the island currently has potable water, a number that has been slowly increasing, since Hurricane Maria ravaged Puerto Rico three weeks ago. But dozens of water and wastewater treatment plants remain inactive after the hurricane. And damage to the laboratories where water quality is analyzed has forced the island's water authority to outsource the task to private entities. The EPA has been working with federal and local governments to assist in the aftermath of hurricane Maria. On Sunday, the EPA received permission from the government of Puerto Rico to use sodium dichloroisocyanurate (NaDCC) tablets for water purification. The tablets were donated by the UN World Food Programme and are used to disinfect water. The EPA, which has authorized a total of $210 million in aid to Puerto Rico, urges citizens to purify water until further notice to prevent gastrointestinal outbreaks and other diseases. In Washington, administration officials held a briefing for all House members on he relief effort in Puerto Rico. Rep. Darren Soto, D-Fla., said those who attended were members with significant Puerto Rican communities in their districts. Soto described a meeting where agency officials defensive spoke of a good job they were doing. "Most of us expected them to point out their shortfalls and how they are going to overcome them," Soto said. Soto said his biggest concern is whether the air assets being used for the relief are sufficient. He said he asked how many daily drops were being done, but the officials did not have that information, which he thought they should know. "I was hoping they'd be more prepared. There are major cities and towns outside San Juan that are not getting daily drops," Soto said. Rep. Steny Hoyer, the No. 2 Democrat in the House, said administration officials informed the members that it has executed two contracts to mobilize "whatever it takes to restore the power grid in Puerto Rico, which is an important step." "I was also pleased that they are beginning discussion on long-term efforts to build the islands to 21st century standards. While progress is being made, I continue to be deeply concerned by reports that there are still rural communities in Puerto that are desperate for food and water," said Hoyer, D-Md. There is some concern among Democrats that Wednesday marked three weeks since Hurricane Maria made landfall and communities are still without life-saving resources, according to a Democratic aide. Some are troubled that by what seems to be a disconnect between FEMA and the governor, the aide said. FEMA has said it is fulfilling every request that comes from Puerto Rico's Gov. Ricardo Rosselló.